We gathered around the screen, poking and prodding at it, experiencing for the first time the fun of finger painting using a digital paint system and a touch sensitive screen. The date? 1981. We were in the Royal College of Art computer lab, which used to occupy a fine Georgian building facing onto Kensington Gore. 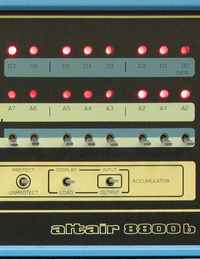 The computer was an Altair 8800; a proper computer with switches and lights on the front panel and an 8 bit external framestore. The paint program had been written by Brian Reffin Smith and we’d been lent one of the first commercial touchscreens (actually a clear screen to go in front of your monitor). I mention this because, finally, touchscreen computers are starting to make an impact in the mass market. That’s just 28 years later. In fact the first research touchscreens came out of the labs in the 1960s and the first commercial touchscreen computer (the HP-150) came out in 1983. What’s the betting that anyone looking to commercialise touchscreen technology would have written a business plan that foresaw consumer adoption as taking somewhere between 2 and 5 years. It’s just so good, so obvious, folks are bound to adopt it quickly. Any VCs out there invested in technology that they expect to reach the mass consumer market in 50 years? Thought not. What I suspect is that folks are yet to learn lessons about touchscreens that we learnt in 1981. First, unless you want to end up like the boy at the back of the class who has had his hand up for five minutes and is having to support it with his other hand, you have to make the screen horizontal to work on it. Ever seen a PC setup with a horizontal screen? No. Secondly, an important characteristic of a computer screen is clarity. Touchscreens tend to end up looking like the plate glass window of a toy shop: near opaque with greasy fingerprints. One problem we didn’t find in 1981 was reported by Jon Honeyball in PcPro this month. His HP touchscreen was showing signs of demonic possession as one of the desktop windows moved across the screen on its own. He finally realised that a particularly big fly was landing on the screen and picking up the window with its feet. You would have thought that HP would have fixed that bug in the last 25 years. Wind forward a few years. High Definition television appears to have finally taken hold in the UK market. Sadly, that appearance is a mirage of the future, not an image of the present, for although 56% of UK households now have an HD television, 91% still watch standard DVDs and get their television through standard set-top boxes. This is a great disappointment to those of us who have been involved in the television industry for some time. I showed my wife her first HD television image at a tradeshow in Brighton. She was amazed by the quality and genuinely excited. She was also genuinely pregnant with our first son, and he is now in his first year at university. When it comes to the lifecycle of technology products there are a bunch of tools that we can fall back on. I have a love hate relationship with management tools. I love the fact that they remind us to think of issues which may have escaped attention. I hate them because, given a structure or process, people tend to follow it slavishly, without thought. There is the Technology Adoption Lifecycle (or Adoption Curve – a slightly better name in my opinion because something that starts with innovators and ends with laggards is not very cyclical). There is the Technology Acceptance Model (TAM) that looks at the usefulness of a technology and the effort required to use it. In model speak this is the “Perceived usefulness” or PU and the “Perceived ease-of-use” or PEOU. Phewee! Then you’ve got the Unified Theory of Acceptance and Use of Technology (UTAUT – I think “you taught” gives a hint as to its origins…) which combines TAM and the Theory of Planned Behaviour. This one suggests that four things; performance expectancy, effort expectancy, social influence, and facilitating conditions determine usage and behaviour. There is also the Gartner Hype Cycle which tracks technology adoption through inflated expectations, disillusionment, enlightenment and, hopefully, productivity. You might remember Gartner, the IT research and advisory company, predicted that blogging would peak in 2007, and advised Apple to quit the hardware business in 2006. Still, with revenues of $1.3bn in 2008, it turns out you don’t have to be right the whole time, but hype clearly helps. Like much in management thinking and economics, the models tend to give you a view of where you’ve been rather than helping you figure out what to do next. Still, if models are your thing, that lot should keep you occupied over the holiday season. Ultimately all of these boil down to the same basic premise. It’s not the technology that matters; it’s the usefulness of the product. Good products get used; bad ones get used as doorstops. That explains our touchscreens and HD TV. Touchscreens are great for kiosks, ATMs and difficult environments where they were adopted years ago, they are not very good for working on documents. HD TV does not (in its current guise) offer much benefit over a high quality Standard Definition image seen on a good HD TV set (the “up-res” can make it as good, or better, than a highly compressed HD signal). So what did I see at the last television tradeshow I went to in September? Stereo (“3D TV”) and NHK’s Super Hi-Vision (that’s the equivalent of 16 HD television images). Both of these technologies deliver great looking images, but how useful and how soon? This entry was posted in imagine and tagged funding, lifecycle, MBA, theory. Bookmark the permalink. Thank you Dr Roberts for giving me the chance to use the altair 8800 (http://news.bbc.co.uk/1/hi/technology/8600493.stm) Bill Gates was not the only one who’s career benefited from your work.